Will the industry headwinds dent Applied Materials Q1 results akin to its peers? 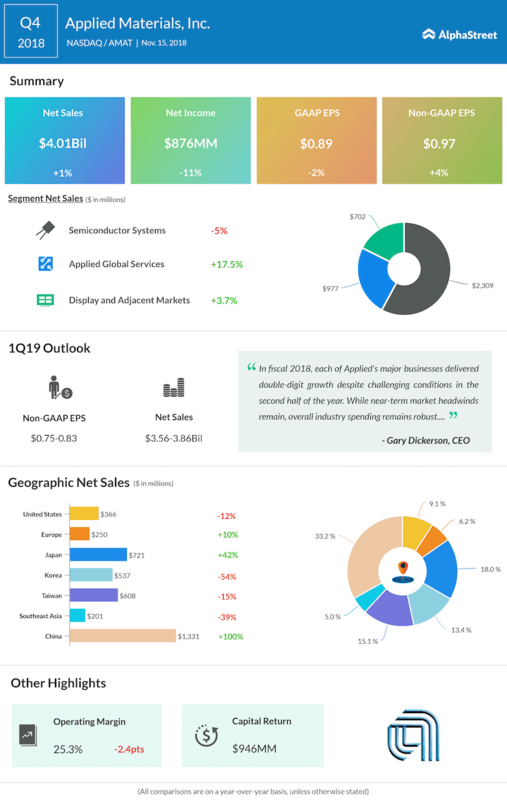 Applied Materials (NASDAQ: AMAT) is scheduled to announce its first quarter results for the fiscal 2019 period on February 14 after the bell. The chip equipment maker is announcing its results just weeks after Texas Instruments (TXN) came up with an earnings beat in its recently reported quarter. Investors seem to be more optimistic about the upcoming Applied Q1 earnings with the stock up above 19% in January. It’s worth noting that the semiconductor industry is facing a slowdown forcing chip makers to curtail spending, scale back new investments due to falling chip prices, rising inventories and lower demand. Texas Instruments recent results are giving investors a glimmer of hope that the industry might come out of the woods in the latter part of the year. Last quarter, Applied’s management told analysts that the demand would pick up in the second of 2019. Investors would be keenly watching comments from the company on the industry outlook and how it will impact the chip equipment maker. For the Q1 period, analysts are expecting earnings of $0.79 per share, a 25% drop from what it earned last year. Revenue is expected to drop 12% to $3.71 billion, factoring in the headwinds facing the industry. In the fourth quarter, Applied Materials expected its Q1 sales to be in the range of $3.56 billion to $3.86 billion and adjusted earnings to be between $0.75 and $0.83 per share. In Q4, the company’s sales surpassed estimates and earnings met the street consensus. Last month, Cypress Semiconductor (CY) Q4 results topped estimates send the stock up 5% after the bell. Advanced Micro Devices (AMD) in the recently reported quarter saw its earnings meeting street expectations resulting in the stock price increasing 9% post the earnings announcement. However, semiconductor giant Nvidia (NVDA) lowered its revenue outlook last month by $50 million as it expects lower sales from its gaming and data center divisions. Three firms usually contribute more than 30% of the company’s top line. In the last fiscal year, the triad, Samsung (13%), Taiwan Semiconductor (11%) and Intel (11%), brought in 35% of the Applied Materials’ revenues. Depending on these three firms performance, Applied’s top line results could see an impact. Intel Corporation (INTC) reported mixed results last month. Despite the earnings beat, Intel’s stock dropped 7% after the bell as it failed to meet analyst estimates. The company also warned investors that due to the trade war between China and the US along with falling NAND prices, headwinds are stronger for the 2019 period. Taiwan Semiconductor (TSMC) also reported weaker results citing increasing inventory, lower demand and weak macros which it expects to continue in the first half of 2019. Along the similar lines, Samsung saw a 29% dip in profits in the recently reported quarter due to a slump in demand for memory chips. The company also added that due to the US-China trade war, slowing the Chinese economy and weaker smartphone sales, earnings would be impacted in 2019. As the three firms have been impacted by the industry headwinds, one can expect Applied’s results to see the ripple effect. In addition to this, investors would be looking at the performance from the Asia Pacific region. China and Korea have been high-growth regions for the firm last year. Taiwan and Japan also saw double-digit growth rates. Management’s outlook on the growth from this part of the world would give signals about how the industry is going to perform in 2019. As the industry is bracing itself for a tough 2019 period, investors would be watching the Applied Materials results with a glimmer of hope.